Anita and I both agreed that these cedar-planked shrimp and grits were truly something special. The shrimp had a nice little spiciness to them. The grits had a fantastic creamy cheesiness to them. And the sauce had that wonderful (but light) Worcestershire sauce-flavored creaminess. Any one of the star components would be absolutely fantastic on it’s own, but together, they made for the perfect dinner. The shrimp do not take long to cook on the cedar plank, so keep an eye on them and don’t over cook them. 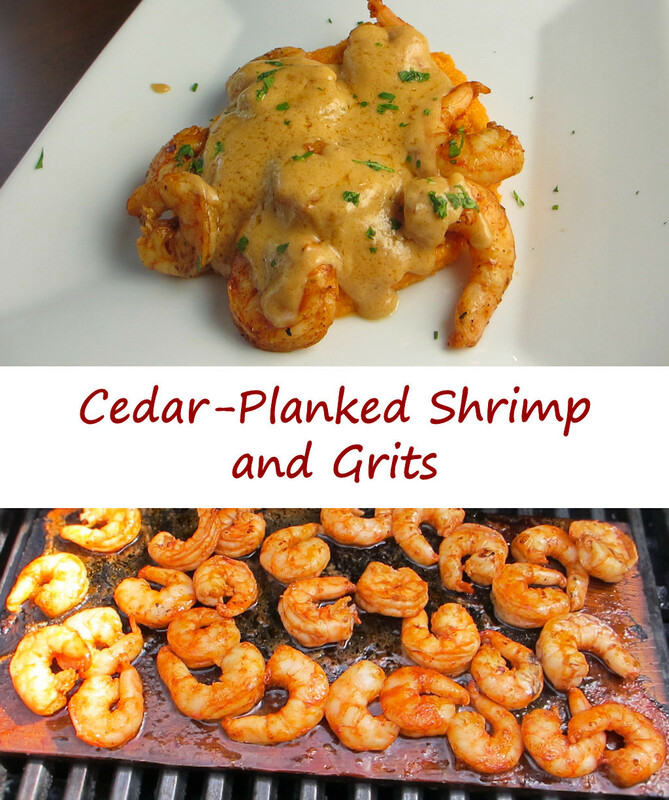 If you don’t have a cedar plank you can cook the shrimp directly on the grill, or skewer them first. I can’t recommend the grits and sauce enough, though I’d eat the shrimp off the grill by themselves any day of the week. Cooking on cedar planks can really change the ordinary into something special, which is why I do it often. Check out my other cedar plank recipes: creamy mashed potatoes, Cajun mashed potatoes, Twinkies, beef sliders, chorizo portabellos, hot dogs, sausage sandwiches and spicy grilled shrimp. Soak plank in water for at least an hour. Stir in the Creole seasoning and BBQ sauce. Place the plank over direct heat until it starts to smoke and char. Remove to indirect heat. Remove the shrimp from the container. Shake off any excess marinade and add to the plank. Cook until the shrimp are pink and done, 10-15 minutes. Bring the broth and butter to a boil in a medium saucepan. Slowly whisk in the grits. Cook for 5 minutes, whisking constantly. Stir in the tomato paste, heavy cream, and the cheese. Keep stirring 2-3 minutes or until the grits are creamy. If they get too thick add more broth or cream. Whisk in the flour and continue whisking until the mixture is thick and has turned light tan in color, about 10 minutes. Slowly whisk in the chicken stock and cream. Cook for 2 more minutes. Add the Worcestershire sauce and hot sauce. Stir. Remove from heat. Serve the shrimp over the grits with plenty of sauce. These roasted vegetable stuffed mushrooms may be one of my favorite summertime grilling ideas. It doesn’t really matter what vegetables you use, either. Just grab whatever vegetables are in season at the store, roast them on the grill, then spoon them into large mushroom caps. Add a bit of seasoning, a little cheese, place onto a cedar plank over a hot fire, and in no time at all you’ll have a great side dish. Grilling on cedar planks can be a sensitive subject. Some folks really don’t care for it, others, like me, love it. I like the light flavor the planks can add (I tend to not get my planks super smoky before adding my food). And it looks cool. And it makes the deck area smell great. I have to admit that I’m cheap, so I re-use planks as much as I can. As long as you don’t burn them too much on one side, you can get a few uses from them. Also try my roasted beet and dill cucumber salad. Soak the cedar plank in water, if using. Fire up your grill for high-heat cooking. Lightly brush the peppers (I used whole peppers and saved the rest for later use) and corn with oil. Place over high heat and roast, turning often, until lightly charred and just tender. Remove from heat, let cool slightly, then chop the peppers and cut kernels from the ear of corn. Place vegetables into a bowl and season with oregano (if desired) and salt and pepper, to taste. Add the cedar plank and let it get hot and smoky, about 20 minutes. Using a spoon, gently scrape out the gills from the mushrooms. Lightly brush both sides of the mushrooms with oil. Place mushrooms on grill cap side up and grill 3 minutes. The mushrooms will start to sweat, but do not overcook them. Remove from heat and place onto the cedar plank. Spoon the vegetable mix into the mushrooms and place onto the grill. Grill for 20 minutes or until the mushroom is almost tender, watching to make sure the plank doesn't catch on fire. If it does, spray it with water from a spray bottle. Add cheese and cook another 3-4 minutes until melted. Remove from heat, garnish with chopped cilantro, and serve.